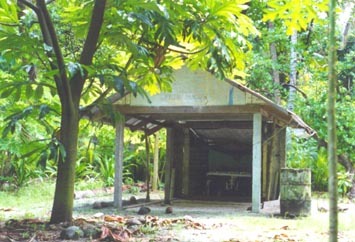 Although no one lives on West Fayu permanently, a small chapel has been constructed to serve the religious needs of the sailors who visit the island sometimes for weeks at a time if a sailing canoe is damaged enroute and needs repair to make the return voyage. A Catholic altar occupies a table inside and a bell hangs from the eaves to call the faithful to prayer. The 50 gallon metal drum to the right is used for collecting rain water. There are coconuts on the island but no potable water.